Seriously, talk about one smart mattress cover. Although it may feel like a bed cover, Luna contains plenty of sleep-tracking hardware. It monitors your breathing, heart rate, and overall sleep cycle over the course of the night, and the best part is you don’t even have to wear anything. Using the information it gathers on its own and what you input about your day, Luna can then make recommendations to help you improve your sleep quality over time. 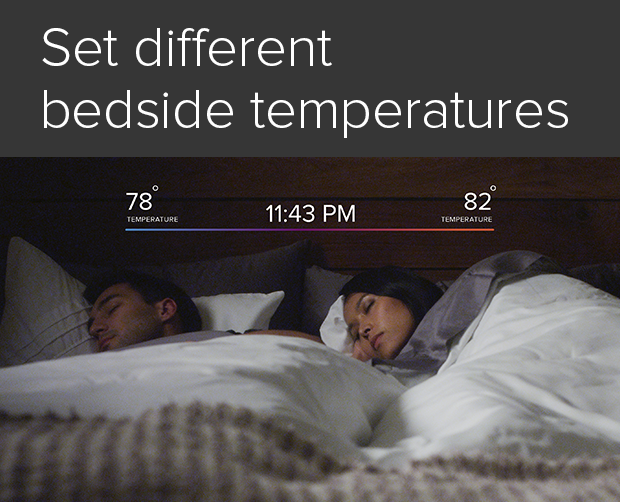 Luna allows you and your partner to each set a preferred temperature preference. As the cover monitors your sleep, it learns what temperature you sleep best at and adjusts your side of the bed accordingly. Even better, it learns what time you usually head to bed and warms up automatically, so you can be cozy as soon as you slip under the sheet. Like other smart alarms, Luna can wake you up at the point in your sleep cycle where you’ll have the most energy. Luna’s website, however, does not clarify how it does this. I would assume by vibrating, but perhaps it turns on the lights. Luna is able to communicate with other smart devices through wi-fi. Currently, the company partners with Nest, Emberlight, Lockitron and Beep, but through its promotional video, Luna has made it clear that it doesn’t want to stop there. It looks like their goal is to make Luna the center of your nighttime and morning routine, powering and shutting down all your devices first thing in the morning and as you get ready for sleep. Today is the first day of Luna’s Indiegogo campaign, and the company has already exceeded it’s $100,000 goal. As of now, you can still pre-order the mattress cover, which is expected to ship in early August, for around $200. You can also get the mattress cover delivered straight to your door by a drone… but that’ll cost you nearly $4,000. Like this article? Follow this blog and then check out a light to help you beat the winter blues.